One of GE’s most popular 3D/4D ultrasound machines to date. The Voluson series, notably one of the most reputable 3D imaging systems. The Voluson 730 is offered as the Voluson 730 Expert with the touchscreen and CRT monitor or as the Voluso Pro if you prefer not to have the LCD touchscreen on the user control panel. 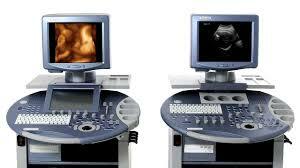 A leading 3D/4D ultrasound machine that is still sold and serviced today. GE’s Voluson line of product has the best reputation for the longest time period for 4D imaging, prenatal, and fetal diagnostics. The Voluson 730 started many years ago and with the continual software and hardware changes, it kept evolving into what the sonographers and physicians needed, a top 3D ultrasound machine which is now offered at an affordable price below $30,000.